Initiating a new partnership today, global health initiative UNITAID and the non-profit FIND began a project that will work towards the improvement, affordability and availability of diagnostics and treatments for the hepatitis C virus (HCV). New medicines have revolutionised HCV treatment in high-income countries, yet the lack of appropriate diagnostic tools for HCV infection remains a challenge. Catharina Boehme, chief executive officer of FIND, outlined that HCV is “a silent killer which goes unnoticed until it is almost too late.” Accordingly, 85 percent of cases occur in low- and middle-income countries, with fewer than 1 percent of persons aware of their infection. The US$38.3 million project aims to develop “better, simpler, point-of-care diagnostic tools for HCV, and will introduce HCV testing and treatment in HIV programmes” with national governments and local implementation partners in Cameroon, Georgia, India, Malaysia, Myanmar, Thailand and Vietnam, over the next three years. Lelio Marmora, executive director of UNITAID, highlighted that the project is about much more than just introducing the treatment, as political space will be opened in the respective countries to reinforce a HCV strategy to create fiscal space and political momentum. Meg Doherty, treatment coordinator within the Department of HIV & Global Hepatitis Programme at World Health Organization, which supports the project, said it will fill an important gap and address a global public need by identifying HIV positive persons, scaling up treatment and looking for ways to reduce prices of the new important drugs. “Today’s new project aims to: make new HCV point-of-care products ready for purchase; make HCV diagnostic tests and treatments available in the health systems of the project countries; lower the prices of HCV testing and treatment; and use findings from the FIND project to drive global and regional policy towards scaling up HCV management,” according to the UNITAID release. 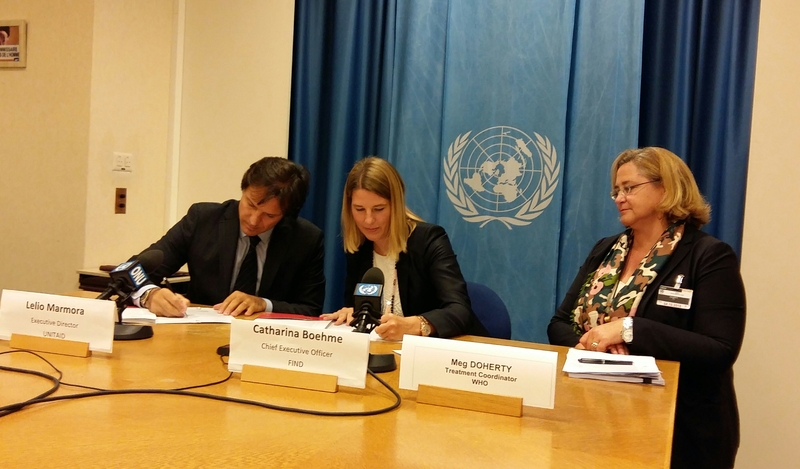 The joint press release by UNITAID and FIND on today’s project launch can be found here. "UNITAID-FIND Partnership To Scale Up Hepatitis C Diagnostics" by Intellectual Property Watch is licensed under a Creative Commons Attribution-NonCommercial-ShareAlike 4.0 International License.